Teaching is not for the faint of heart, but imagine teaching in a foreign language. That was the assignment Upper School Spanish teacher Brenda Semmelrock tasked her Spanish three honors students. After a few days of research, the students provided a short lesson in Spanish on an array of topics. “The students are an incredibly high energy, interested group. They are so open to everything,” Semmelrock said. She couldn’t contain her enthusiasm as she described each student’s topic. Props were encouraged to allow the students to use various nouns and adjectives. The students used appropriate tenses depending on whether they were speaking about current or past events. Sydney Dwyer ’21 presented her research on the chupacabra, the legendary vampire-like creature that stalks livestock and was purported to be seen roaming the Hartford environs. If you've considered growing a pineapple tree, Evan Banning ’21 provided a step by step guide. But, be prepared to be patient, as Banning said it may take three years for the tree to bear one fruit. Throughout the class, there was plenty to eat as Brandon DeLucia ’21 explained how to make decorative icing on cookies and then brought enough for everyone to eat. And, what Spanish class would be complete without the guacamole that Caitlin Budzik ’21 showed how to prepare. Accompanying the class was a mix of hot Latin sounds compiled by Ahana Nagarkatti ’21. There was no shortage of interesting games to learn about: Emma Henry ’21 taught Quidditch on a Lego board, and Brandon Flowers ’21 shared the curious English sport of shin kicking where players stuff their pants with straw. Jean Wang ’21 taught the class a history lesson about the Chinese dragon boats, a tradition to commemorate the death of the ancient scholar-poet Qu Yan. Participants in the festival scatter rice in the water to feed the fish and to prevent them from eating the remains of Qu Yan who was thrown into the water. 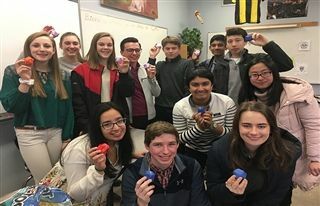 Other lessons included Adam Na ’21 "How to Make Pancakes," Esha Kataria ’20 "How to Manage your Time," and Sydney Smith ’21 "How to Make Origami Cubes." “The Spanish language just flows through the students so freely,” Semmelrock said. “The comfort level of their speaking just wows me. Through their fluency in a foreign language, we are preparing students to become global citizens." All teaching in Spanish 3 is done exclusively in Spanish - no se habla ingles aqui. This course focuses on reinforcing and combining basic skills along with the study of advanced grammar structures. The honors class moves at a faster pace and requires communications skills with greater depth and analytical style.